In 1961, the OECD organised a conference on human capital that propelled education into the centre of policy-making worldwide (OECD 1962, Schultz 1961). This month, the OECD and the London School of Economics (LSE) are holding a conference on subjective wellbeing that they hope will usher in another revolution – where policymaking at last aims at what really matters: the happiness of the people. As Thomas Jefferson once said, “The care of human life and happiness… is the only legitimate object of good government”. But to make policy requires numbers. Human capital took off once people realised its high rate of return. Wellbeing will only take off when policymakers have numbers that tell them how any change of policy will affect the measured wellbeing of the people, and at what cost. The first step is a clear unified account of how wellbeing is currently determined. Our book, the first draft of which will be presented as the conference, aims to provide this, using large surveys from four major advanced countries (Clark et al, forthcoming). One key issue is to adopt a single definition of wellbeing. 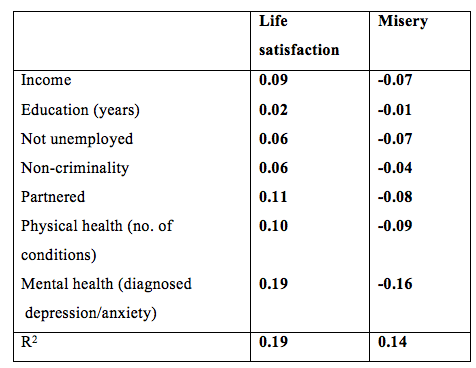 The right definition, in our view, should be life satisfaction: “Overall how satisfied are you with your life, these days?”, measured on a scale of 0 to 10 (from “extremely dissatisfied” to “extremely satisfied”). That is a profoundly democratic concept because it allows people to evaluate their own wellbeing rather than have policymakers deciding what is more important for them and what is less so. Moreover, policymakers like the concept – and so they should. 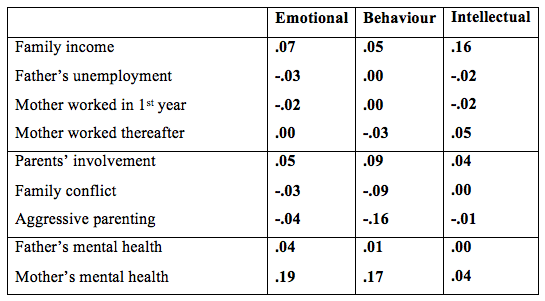 Work in our group at LSE shows that in European elections since 1970 the life satisfaction of the people is the best predictor of whether the government gets re-elected – much more important than economic growth, unemployment or inflation (see Table 1). Notes: Eurobarometer data on life satisfaction and standard election data for most European countries since the 1970s. So the task is to explain how all the different factors affect our life satisfaction, entering them all simultaneously in the same equation. There are of course immediate influences (our current situation) but also more distant ones going back to our childhood, schooling and family background. Figure 1 gives a stylised version of how our life satisfaction as an adult is determined. We can start with the immediate causes, as shown in Table 2. The first column measures how far different factors can explain the wide dispersion of life satisfaction in the population. As can be seen, the big factors are all non-economic (whether someone is partnered, and especially how healthy they are). The partial correlation coefficient on income is 0.09, which means that less than 1% of the variance of life satisfaction is explained by income inequality. Notes: Data mostly from the British Household Panel Survey (BHPS), using pooled cross-sections. The non-criminality result comes from the British Cohort Study using arrest data up to age 34. The mental health result comes from cross-sectional analysis of the Household, Income and Labour Dynamics in Australia (HILDA) and the US Behavioral Risk Factor Surveillance System (BRFSS), which both give very similar results. An obvious question is: do economic factors play a bigger role if we focus only on those who are least happy (the bottom 10% of the population in terms of life satisfaction)? We investigate this in the second column of Table 2, which explains whether somebody has as little life satisfaction as the lowest 10% of the population. The results are almost the same as before. When we ask what distinguishes Les Misérables from the rest, the biggest distinguishing feature (other things equal) is neither poverty nor unemployment but mental illness. And it explains more of the misery in the community than physical illness does. 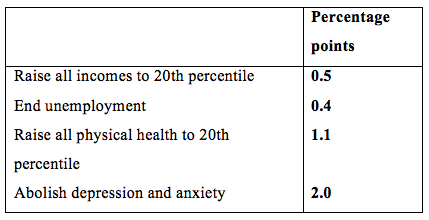 In fact, it is interesting to ask: “If we wanted to reduce the numbers in misery, what change would have the biggest effect?” This is addressed in Table 3 – if we could abolish depression and anxiety, it would reduce misery by as much as if we could abolish all of poverty, unemployment and the worst physical illness. Table 3. What would most reduce the percentage of people in misery (ceteris paribus)? Notes: Data mostly from the BHPS except for depression. Total in misery is 10 percentage points. Except for poverty, we cannot of course completely abolish any of these things, but we can reduce them all at the margin – and at a cost. So Table 4 estimates very roughly the average cost of reducing the numbers in misery by one person, through different policies. As Table 4 shows, it costs money to reduce misery, but the cheapest of the four policies is treating depression and anxiety disorders. This is why the Centre for Economic Performance at LSE has been involved in two major mental health initiatives. Since 2008, Britain’s National Health Service has developed a nationwide service with different local names but known generically as Improving Access to Psychological Therapies (IAPT). This programme now treats over half a million people with depression or anxiety disorders annually, of whom 50% recover during treatment. Because of financial flowbacks, we believe it in fact costs the government nothing, so that the cost shown in Table 4 is an exaggeration (Layard and Clark 2014). In addition, we should try to prevent mental illness before it occurs, so a second initiative is preventive – a four-year curriculum called Healthy Minds, one lesson a week. This too has very low costs since children are already spending an hour a week on life skills lessons of unknown, but probably, low effectiveness. 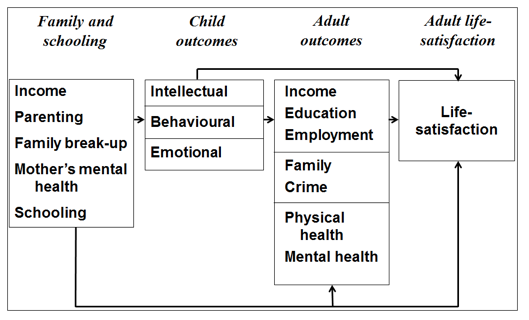 The importance of prevention becomes even more evident if we revert to the life course diagram with which we started and try to predict adult life satisfaction from earlier in a person’s life, from their child development – their academic qualifications, their behaviour at 16 and their emotional health at 16. Figure 2 shows the relevant partial correlation coefficients. The best predictor of an adult’s life satisfaction is their emotional health as a child. How on earth did so many policymakers come to believe that qualifications were the be-all and end-all – ‘in the interests of the child’? Notes: British Cohort Study data. Intellectual performance is highest qualification. Behaviour at 16 as reported by the mother and emotional health at 16 as reported by mother and child. The final step in our book is the explanation of these child outcomes, using data from the Avon Longitudinal Study of Parents and Children (ALSPAC), which has surveyed children born in and around the city of Bristol in 1991/92. This is shown in Table 5. Academic performance is the outcome on which most existing research has focused, and it is profoundly affected by family income. But the emotional health of the child is the best measure of the wellbeing of the child, and it is also (as we have seen) the biggest determinant of the wellbeing of the future adult. It is affected to some extent also by family income but above all by the mother’s mental health. The same is true of the child’s behaviour – which also affects the wellbeing of so many other people. What about the effect of schools? In the 1960s, the Coleman Report in the US told us that parents mattered more than schools. Since then the tide of opinion has turned. Our data strongly confirm the importance of the individual school and the individual teacher. This applies equally to the academic performance of the pupils and to their happiness. So in Figure 3, we look at the emotional wellbeing of children at 16 and show how it is explained. The top bar shows the combined effect of all observed family factors (treated as a single weighted variable). The next bar shows the enduring effect of the primary school a child went to (again a single aggregate of dummy variables) and the last is the effect of secondary schools. Schools really matter. Let us end with the thorny question of income. As we have seen, income inequality explains a very small fraction (under 2% in any country) of the variance of life satisfaction. But the effect of log income is well determined, and similar in all countries. One would therefore have expected economic growth to bring considerable increases in life satisfaction. But in many countries, it has not – the so-called ‘Easterlin paradox’ (Easterlin 1974). This is illustrated for our four countries in Figure 4. Our analysis provides an explanation of this. People adapt to higher levels of income over time, but much more importantly, they also compare their own income to that of their peers. Using the BHPS, we find that life satisfaction (0-10) is predicted mainly by an individual’s income relative to that of others in their peer group as defined by age, gender and region. The same is true in Australia and Germany. Notes: Data from Britain/BHPS; Germany/Socio-economic Panel (SOEP); Australia/HILDA; US/General Social Survey. At last the map of happiness is becoming clearer and usable for policy analysis. We now need thousands of well-controlled trials of specific policies from which we can obtain estimates of the effects on life satisfaction in the near and longer term (where our book can contribute valuable coefficients). We can then compare those gains to the net cost of the policies. The optimal mix will surely be very different from the one we have now. Clark, A E, S Flèche, R Layard, N Powdthavee and G Ward (forthcoming), The Origins of Happiness, Princeton University Press. Easterlin, R A (1974), ‘Does Economic Growth Improve the Human Lot? Some Empirical Evidence’, in R David and M Reder (eds), Nations and Households in Economic Growth: Essays in Honor of Moses Abramovitz, New York: Academic Press: 89–125. Flèche, S (2016), ‘Teacher Quality, Test Scores and Non-Cognitive Skills: Evidence from Primary School Teachers in the UK’, CEP mimeo. Layard, R and D M Clark (2014), Thrive: The Power of Evidence-based Psychological Therapies, London: Penguin. OECD (1962), ‘Policy Conference on Economic Growth and Investment in Education, Washington, 16th-20th October 1961: Targets for Education in Europe in 1970’, paper by I Svennilson in association with F Edding and L Elvin. Schultz, T W (1961), ‘Investment in Human Capital’, American Economic Review 51(1): 1-17. Ward, G (2015), ‘Is Happiness a Predictor of Election Results? ’, Centre for Economic Performance Discussion Paper No 1343 , LSE.